Finding Love, Friendship, and a Career at Kogod Kogod alumnus Steve Gould found the career of his dreams and love of his life—all at one school. Steve Gould and his wife, Leen, September 2018. Credit: Steve Gould. From a young age, Kogod alumnus Steve Gould was fascinated with trains. This early passion would set the foundation for the rest of his life, leading Gould to find the career of his dreams and the love of his life—all at one school. “The education I received at American University was what inspired me to pursue [transportation and supply chain management] as a career,” Gould said. In 1957, Gould arrived on AU’s campus, after his high school guidance counselor steered him away from locomotive engineering and advised him to look into transportation management schools. At the Kogod School of Business, his love of trains and railroads flourished. He eagerly awaited each course in his major, which he considered crucial to learning about his future career. His coursework not only showed him the ins and outs of railroads, but also all the different modes of transportation. “My course work laid the foundation for [my] career and I was hooked...hook, line, and sinker!” Gould said. As one of the few Transportation and Traffic Management majors, Gould met friends that would, later in life, become members of the self-named “AU Railfan Crew.” Today, the group plans trips to various locales to ride and photograph different types of trains. But his senior year, Gould found a different kind of love. When he needed a date for the Interfraternity Dance, a friend arranged a blind date between Gould and Leen Sellendi, a freshman at the time. Several days before the dance, Sellendi and Gould met in the Hughes Hall lounge, and the rest is history. While he attended college, Gould had a deferment from the draft, and was pushed to the top of the list once he graduated. Instead of being drafted, he decided to enlist in the US Army Transportation Corps to align his three years of service with his future career goals. All the while, Gould kept in contact with Sellendi—driving to Poughkeepsie, New York, and Washington, DC, to see her. “On our last visit, we decided that we would get engaged,” Gould said. Gould’s proposal was a little unconventional. He didn’t have the ring during his last visit, and ended up bringing it back to Germany where he was stationed. Instead of popping the question in person, Gould sent his soon-to-be bride the engagement ring by mail. “She got it, put it on, and blew her classmates away that she had it!” he said. In June 1963, Gould left the army, returned home, and the two finally got married. Once he finished his three years of service in 1964, Gould quickly became entrenched in his field. He worked for Standard Brands Incorporated for 12 years and then moved on to Pepperidge Farm, where he became the Vice President of Distribution. 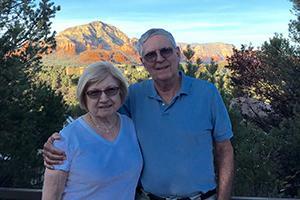 All the while, Leen and Gould enjoyed life side-by-side, and are due to celebrate their 56th anniversary in 2019. At Kogod, Gould didn’t just receive an education that launched him into his dream career; it was also the place where he developed his most cherished relationships. If you want to catch up with Gould these days, you can most likely find him planning his next big train trip with his fellow AU Railfan Club members. Or, of course, enjoying life with Leen.